Brushing and flossing have their limits when it comes to combating bad breath. The effects of toothpaste wear off as the day progresses. Liquid mouth fresheners can be a great option, but they are not exactly very convenient to carry around, be it in the office, or for evening parties. This is where you will find a breath freshener spray incredibly useful. You don’t have to worry about any spills, and they are often compact enough to be carried in your pocket/purse. To learn more about the best breath freshener spray brands, check out our review below. This spray tries to kill two birds with one stone. It has an innovative formula that cleans and whitens your teeth while making your breath fresh at the same time. The formula is capable of wearing down the visible effects of stains from coffee, wine, tea, and tobacco. It is a slow acting product, so you can expect effects with continuous use only. However, on the freshening front, this spray from EverSmile is lightning quick, of course! It has a cool and refreshing mint fragrance. The spray bottle is very compact and has been designed for portability. Each bottle contains around 10ml or 0.34 fluid ounces. If you want an option with fewer chemicals and more organic ingredients, Herb Pharm might be the best breath freshener spray for you. This is a herbal breath spray powered by essential oils of spearmint and cinnamon. The product has an organic certification and does not contain any artificial sweeteners or colors. The https://www.oberlo.com.ph/ecommerce–wiki/manufacturing” rel=”nofollow”>https://www.oberlo.com.ph/ecommerce–wiki/manufacturing” target=”_blank” rel=”noopener”>manufacturer is a small company that handcrafts their products in small batches, so quality is assured. They are based in Oregon. The bottle is very compact and should fit comfortably into most pockets and purses/handbags. Each bottle contains 0.4 fluid ounces or 14ml of the liquid. This is yet another option to consider if you want to go the organic route for your daily mouth freshening spray. Like the other brand above, the EO spray is also certified organic. It does not contain any synthetic fragrance or additives. The natural alcohol-based spray has a fast and effective action against bad breath. The formula uses the power of clove and peppermint oils, with extracts from natural menthol and allspice. The alcohol is organic and derived from sugarcane. The spray bottle is really well designed and compact. Each bottle contains 0.33oz, enough for over 100 sprays. CloSYS is one of the major names in oral care. This is a classic spray from them, powered by the refreshing effects of mint. The formula is sugar-https://bestreviewsinfo.com/best–sulfate–free–shampoo/” rel=”nofollow”>https://bestreviewsinfo.com/best–sulfate–free–shampoo/“>free and does not contain any harmful aerosols. It also does not contain alcohol or triclosan. You can use this gentle, non-irritating formula all through the day, whenever you need a quick touch up. The compact bottle is designed for portability and will fit comfortably into a pocket. You get 0.25 ounces of the formula in each bottle of CloSYS Oral. If you are into paleo diet and lifestyle, you might find The Dirt Spray quite attractive. This organic spray has been paleo certified. That means that it contains no GMO ingredients or artificial sugars. Instead of alcohol, this formula https://bestreviewsinfo.com/waterproof–work–boots/” rel=”nofollow”>https://bestreviewsinfo.com/waterproof–work–boots/“>works using the power of all natural essential oils. Other ingredients include coconut oil and high-quality stevia extract. Instead of a plastic bottle, you get this spray in an environmentally friendly glass bottle. The product is compact, but care must be taken if you carry it around, as it is glass. The bottle contains enough liquid to last you for around 200 sprays. 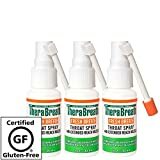 TheraBreath is a famous brand started by doctor Harold Katz. This spray is part of the brand’s diverse portfolio of oral care products. The formula is very potent and uses clinically proven natural compounds like teat tree https://bestreviewsinfo.com/best–argan–oil–shampoo/” rel=”nofollow”>https://bestreviewsinfo.com/best–argan–oil–shampoo/“>oil, Zinc, and Oxyd-8. The spray has undergone extensive clinical testing for efficiency. The bottle has a unique design that allows this spray to reach all parts of your mouth with ease, including the throat. This increases the impact of the spray on bad breath. The bottles can be bought in single or three-packs. Each one contains one ounce of breath freshener spray. This is an excellent mouth spray with dual action: it removes bad breath and also helps avoid dry mouth. It has a very soothing effect on your mouth. The mint flavored spray does not contain any alcohol or sugars. Dentists often recommend this product for their patients. The bottle is very portable, and you can easily use this spray on the go. The mild mint flavor has a decent freshening effect. 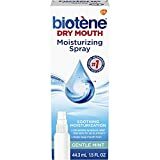 Each bottle of Biotene contains 1.5 ounces of the liquid formula, so this fourth best breath freshener spray should last for a long time. 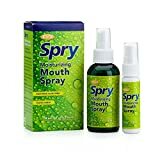 Spry is the best breath freshener spray if you need a respite from both bad breath and dry mouth. This special dual-action spray uses the power of https://food.ndtv.com/health/7–reasons–to–drink–aloe–vera–juice–everyday–1627032” rel=”nofollow”>https://food.ndtv.com/health/7–reasons–to–drink–aloe–vera–juice–everyday–1627032” target=”_blank” rel=”noopener”>aloe vera extracts to https://www.utmedicalcenter.org/healthy–tips/103/the–importance–of–moisturizing/” rel=”nofollow”>https://www.utmedicalcenter.org/healthy–tips/103/the–importance–of–moisturizing/” target=”_blank” rel=”noopener”>moisturize your mouth. For the breath freshening action, the Spry formula uses spearmint extracts. As the name promises, this product uses xylitol as a sweetener to promote saliva production and combat dry mouth. The formula does not contain any drugs or GMO ingredients. It is safe for all age groups. Spry offers a small 1oz bottle for use on the go, as well as a combo pack that includes a larger 3.5oz bottle that you can keep at home. 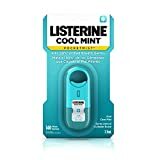 You cannot discuss breath fresheners without including the name Listerine. More famous for their wide range of mouthwash products, the renowned brand also has several products in this category. The PocketMist is a tiny oral spray from Listerine. The formula has a vigorous action against bacteria that cause bad breath. 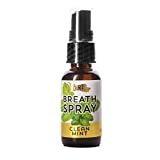 The safe and effective formula of this second best breath freshener spray does not contain any sugar. The fresh breath effect is potent. Each ultra-compact bottle of Listerine contains 7.7ml of the product, which is enough for around 140 sprays. The Binaca spray is a popular bestseller when it comes to best breath freshener spray brands. This is a very useful spray that comes in a handy pump bottle. It does not contain any aerosols. The formula is also sugar-free and has a fast and efficient action against bad breath. The main reason why this product is so popular is its powerful flavor and action. It might feel overpowering for some folks, so be mindful of that. Otherwise, this is the best breath freshener spray if you want to combat bad breath on the go. The bottle is very compact and contains 0.5 ounces of the formula. You can choose between all-natural herbal sprays and more powerful chemical-based formulas to control your bad breath. What you choose is entirely based on your preferences. All the products mentioned here are very effective in keeping your breath fresh when you need it most. What is the best breath freshener spray you’ve ever tried? Tell us down below.